The 5801 provides spot-check measurements of oxygen saturation of arterial hemoglobin. Widely used in hospitals, home healthcare, community medical centers, and more. 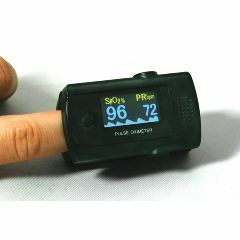 It can monitor pulse oxygen saturation and pulse rate through patient's finger. It is also widely used for sports, climbing, and avionics. Lightweight. Good Smell. Good Value. Easy To Use. Effective. Men. Weekly Use. On-the-go. Women. Battery installation instructions were unclear and incorrect. Otherwise the product functions as it should. Good for home health care use. Will this pulse oximeter work in the presence of atrial fibrillation?